Arthurâ„¢ and his friends face one of the biggest challenges of their young lives, and heâ€™s inviting the next generation of Arthurâ„¢ fans to help him! Mixing critical thinking skills with two sets of accessible rules for younger and older children alike, Arthurâ„¢ Saves the Planet does a wonderful job of proving that childrenâ€™s board games can be both fun and educational. 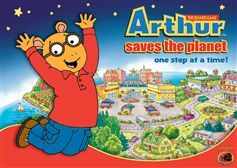 In Arthurâ„¢ Saves the Planet: One Step at a Time, Arthurâ„¢ and his friends & family work together to solve environmental issues threatening his hometown of Elwood City. From littered beaches to endangered tree frogs, from deforested parks to wasted water, the team has its work cut out for it. And ANYONE can help! Pick an Arthurâ„¢ character and collect colored resource cards representing time, expertise, friends, effort and advice. Arthurâ„¢ Saves the Planet provides a unique and challenging design for children to actually experience the joys of strategic gaming with their parents and friends! Players aged 4 and up must decide whether to move their character to a specific location on the board, or collect another resource card. Never leave your house and you wonâ€™t solve any problems, but if you donâ€™t take time to collect resources, such as helpful friends and expert advice, then youâ€™ll never find the right solutions! With environmental concerns weighing on many parentâ€™s minds, Arthurâ„¢ Saves the Planet helps start important conversations between adults and children about humanityâ€™s impacts on the planet and what everyone, young and old, can do to help.